The Audi e-tron Quattro SUV is going to be a massively important vehicle for the four-ringed brand. It will be the first ever all-electric production vehicle to be sold by Audi and it’s coming at the right time, following the brand’s continuous diesel scandal. Though, we’ve only ever really seen the Audi e-tron in concept-guise, so it doesn’t really seem real at the moment. However, that doesn’t mean it isn’t real, nor does it mean that Audi isn’t ready to start taking actual orders on it. Due to launch later this year, Audi is already prepping the market for its arrival. According to Automotive News, an Audi Spokeswoman has confirmed that Audi has already taken 5,000 orders for the Audi e-tron in Norway. The deposits for the Audi e-tron cost future customers 20,000 Kronor (2,000 euros), which is double the cost of what Tesla was asking for its Model 3. Admittedly, though, the Audi e-tron will actually be a mass production vehicle and will actually be available for purchase when Audi says it will be. Unlike the vaporware that is every Tesla. Apparently, Audi will also be taking early orders in Switzerland, Austria, Germany, China and Belgium, the latter of which is where the e-tron will be built. According to Auto News, the Audi e-tron will be unveiled at the Audi Summit in August of this year, much like the brand-new Audi A8 was in July of 2017. It will finally go on sale by the end of 2018. It will also be the first of three all-electric cars Audi will launch by 2020. The second will be the Audi e-tron Sportback, likely to be similar in size, luxury and performance to the S5 Sportback. The third will be a small, electric city car built on VW Group’s new MEB electric architecture. 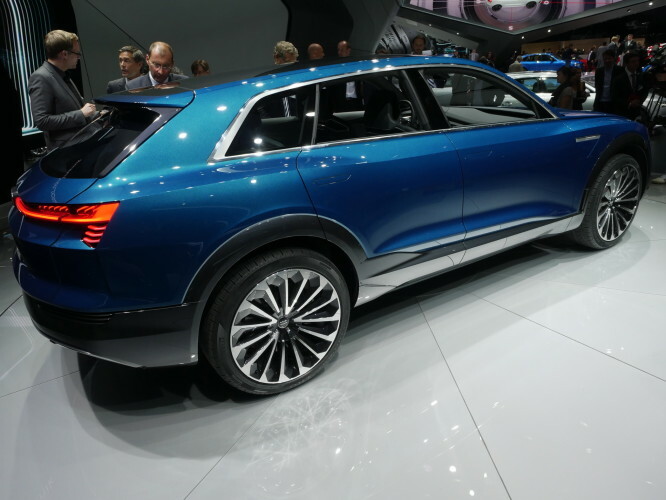 According to Audi, the e-tron SUV which will debut later this year will have a total range of 311 miles, which is better than any other EV product on the road. It will also have 496 total system horsepower from its two electric motors, torque-vectoring all-wheel drive and a 0-60 mph time of 4.6 seconds. While its speed and performance aren’t as good as those of the top-end Tesla Model X, its range is better and it’s not what we’d call slow. We’re incredibly excited to see what the Audi e-tron actually ends up being and we can’t wait to drive it. Should an Audi Q2 Cabriolet be made to take on competitors?